THE Papua New Guinea Hunters start their off-season training in Port Moresby on November 24 with the venue yet to be confirmed. The coaching staff and players are expected to reassemble in the nation’s capital between Nov 20-22, with their base of preparations tipped to be the Sir John Guise Stadium. The Hunters leave their home of two seasons in Kokopo, East New Britain. the club was in the process of transporting its equipment and materials to the National Capital District from Kokopo. 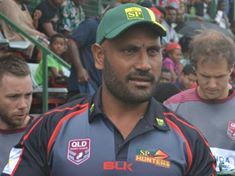 Marum said an announcement would be made by the Hunters board before the end of the month about the 2016 squad for the club’s third year in Queensland’s Intrust Super Cup competition. The Hunters finished second at the end of the 2015 regular season and played finals football for the first time. They lost 26-12 to the Townsville Blackhawks and 28-12 to eventual premiers, the Ipswich Jets, in the finals. Marum, who was named ISC coach of the year for 2015, said there would be changes to the squad with some players expected to be let go while fresh faces would be included in the pre-season training camp. After completing their season in September some of the Hunters squad members have kept busy playing in local competitions across the country but most have taken a well-earned rest as they prepare for the new season.